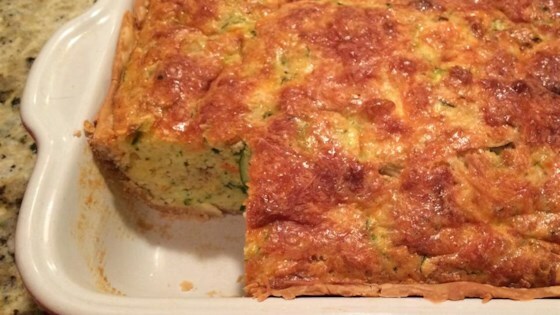 "Sweet and delicious use for zucchini! Halfway between a bread and a pie!" Preheat oven to 350 degrees F (175 degrees C). Press pie crust into a 9-inch square pan. Heat olive oil in a skillet over medium heat; cook and stir onion until transparent, 5 to 10 minutes. Add garlic, oregano, cayenne pepper, salt, and black pepper to onion; cook and stir until fragrant, about 2 minutes. Remove skillet from heat and cool onion mixture slightly. Mix onion mixture, zucchini, eggs, carrot, 1/2 of the Cheddar cheese, and Parmesan cheese in a bowl. Stir cornbread mix and milk into onion-zucchini mixture; pour into the pie crust. Pinch pie crust edges down into the pan until 1/4-inch from the top. Sprinkle the remaining Cheddar cheese over the filling. Bake in the preheated oven until pie is set in the middle and the top is golden brown, about 45 minutes. I slice the zucchini and carrot on a mandolin. My SO loves this and requests it often. I loved this! Only change I made was I did not use a pie crust. I just made the filling and baked it in a shallow baking dish. Delish! Made it just like the recipe. I will make it again. Might add cooked bacon or sausage for a complete breakfast casserole. Yummy!!! So sweet and delicious! Kids would love this, and not even know they're eating their veggies! Very hearty recipe. You could have this as a meal!